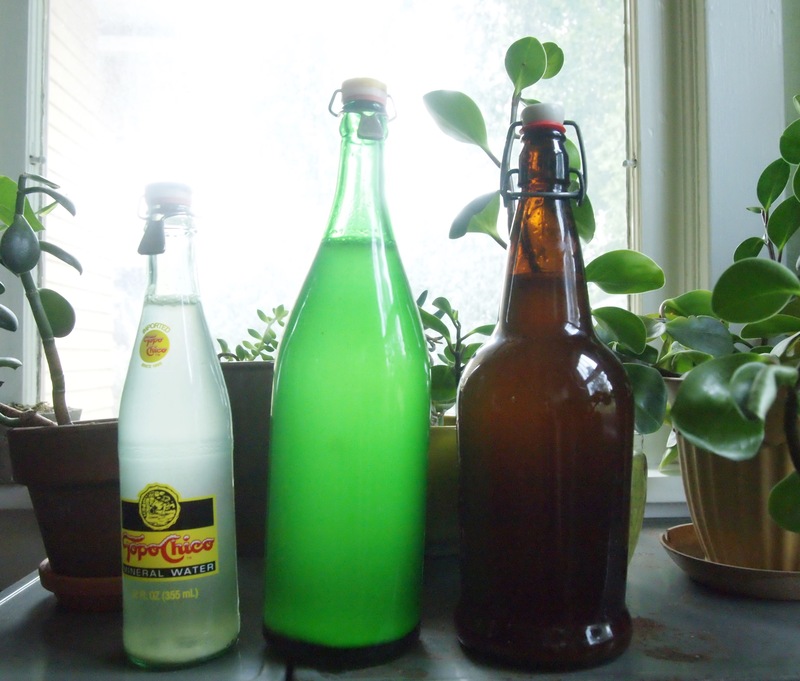 Why do I feel the need to write fermented in front of ginger beer? 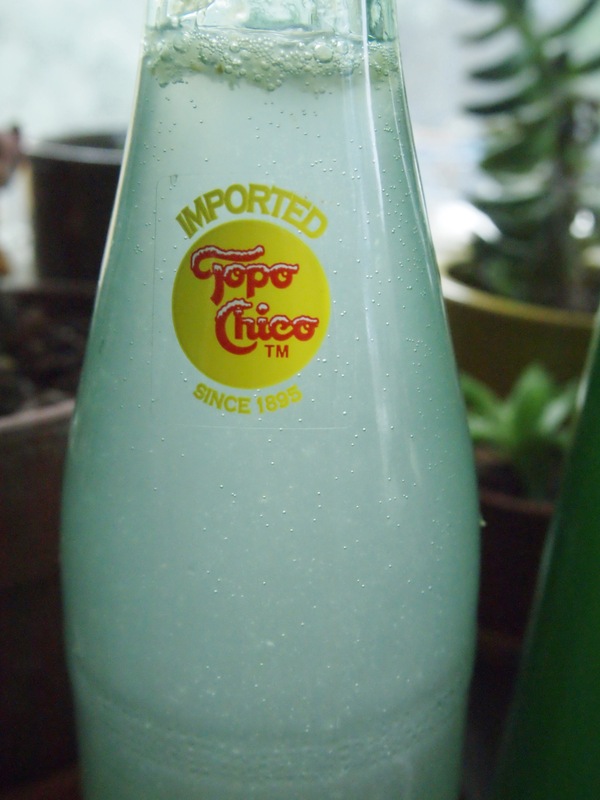 This delectable drink has been popularized in the last years as a beverage on its own as well as a superior addition to cocktails. 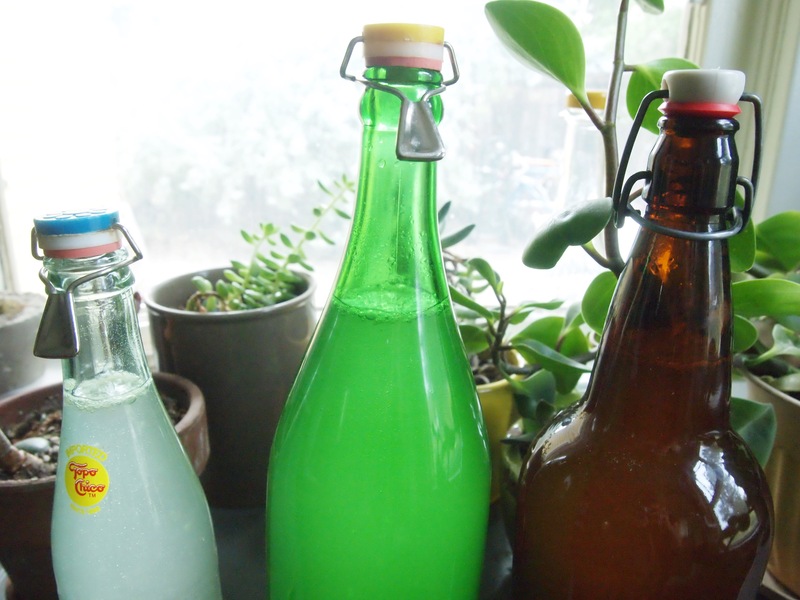 However, I have noticed how it is rarely fermented commercially and carbonation is added in to plain ginger-sugar water. For shame! At the risk of sounding elitist, I feel ginger beer should only be named as such if it has been fermented, as real beer must be. My short time living in Australia was where and when I discovered how truly delicious ginger beer can be. The Aussies know how to make it well. In my quest to find out how to make it at home, purely natural of course, led me to the perfect recipe from Zero Waste Chef. She is one of the persons who inspires me most in my zero waste pursuits. Check out her blog for delectable food and treats, all package free! The recipe as is fills up these three bottles pretty much perfectly. I found some reusable bottle tops on Etsy and use them all the time! The brown bottle is a swing top and works best for this bubbly brew, but I love pouring from the fancy green bottle because I feel I am in a Hemingway novel; namely The Garden of Eden. Check out this carbonation action! I am in love! I try to make it about once every two weeks. The process is similar to sourdough where you must keep a starter; this is known as a ginger bug, which gives me giddy thoughts about caring for a cute wee insect. You’ll chop up organic ginger and throw it in some water to boil. Add sugar, let it cool to room temperature so as not to kill those heavily sought after microbes, then add more cool water, a bit of lemon if you like, and some of your ginger bug liquid. Bottle it up and don’t forget to burp it daily (it’s your baby, after all) then refrigerate and imbibe to your heart’s desire!